National Poetry Writing Month (aka #NaPoWriMo) begins today! We’ll be providing poetry prompts throughout April, to encourage writers everywhere to write one poem each day in response to the work of Edward Thomas, a poet who fought in the First World War and died exactly 100 years ago, in April 1917, at the Battle of Arras. We’re incredibly fortunate to hold a collection of material relating to Edward Thomas, including original manuscripts of some of his poems, letters, photos and notebooks. We’ll be launching an exhibition of some of these items later in April, but if you aren’t able to get to Cardiff, you can follow us on Twitter or Facebook to receive the daily prompts and find out more about Thomas’s eventful life. Anyone can take part in National Poetry Writing Month, and you can keep your poems to yourself or post them online for others to see. It doesn’t matter where you live, and it doesn’t matter whether you’ve ever written a poem before – the point is to be inspired and to write something every day. Circle the names that stand out and write a poem using them as a starting point. If you live nearby, come along to our poetry performance event on 21st April, supported by Literature Wales, which includes an Edward Thomas themed open mic. There is also an Edward Thomas conference taking place later this month, organised by the School of English Communication and Philosophy. 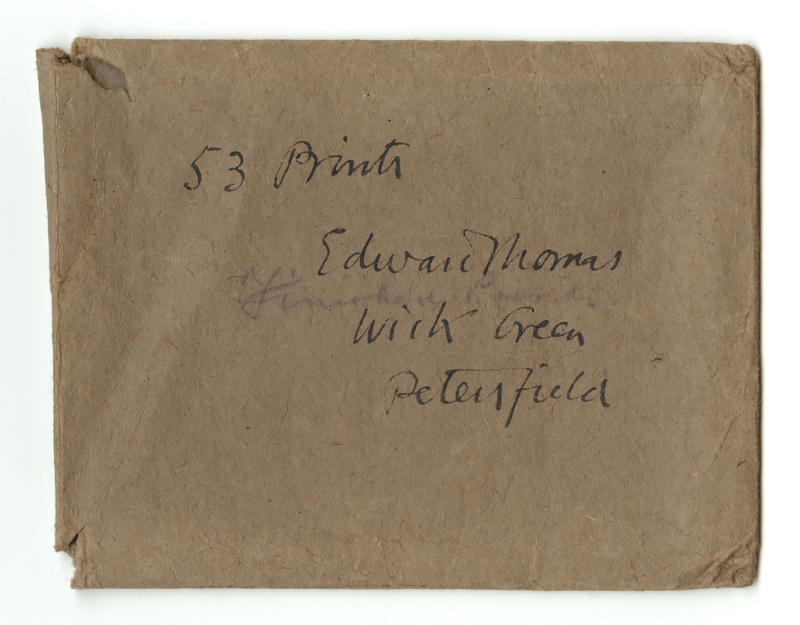 The story started here: while undertaking the cataloguing of the Edward Thomas archive – the slow and careful process of examining, describing and categorising one man’s belongings – I came across a small, slightly battered envelope marked ’53 prints, Edward Thomas’. 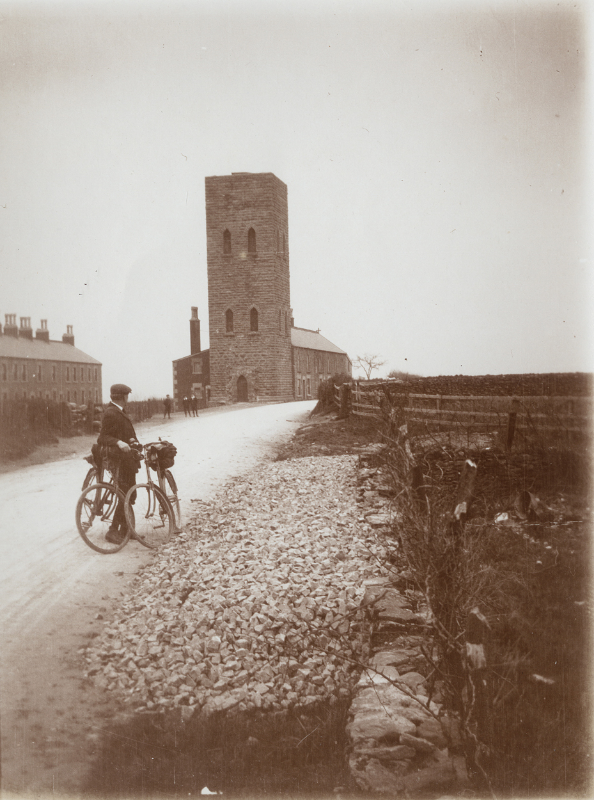 The photos were of locations Thomas had visited over 100 years ago, taken during a cycle ride from London to Somerset, via the cathedral towns of Winchester, Salisbury and Wells over Easter weekend, 1913. 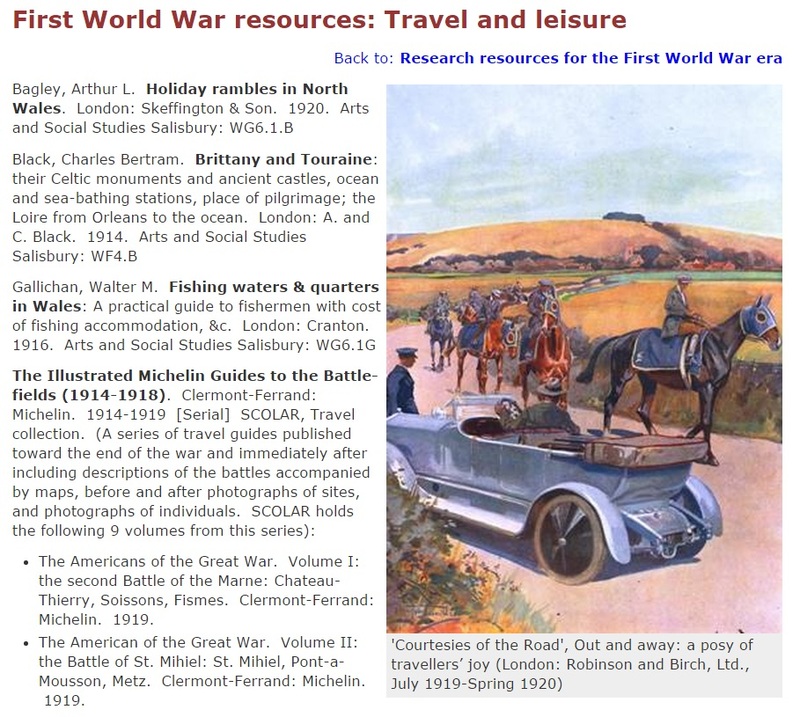 The journey was to provide inspiration for his prose work, In Pursuit of Spring – a celebration of nature, Spring and the English landscape in the months prior to the devastation of the First World War. Landscape photographer Rob Hudson visited Special Collections and Archives this time last year, with a general interest in finding out more about the contents of Edward Thomas archive. I showed him notebooks, poems drafts, and letters from the poet, which are the usual objects of interest, and as an afterthought, considering his interest in photography, brought out the little packet of photos. Some had locations pencilled on the reverse, and as we peered and puzzled over the names, I could tell Rob had been struck by inspiration. 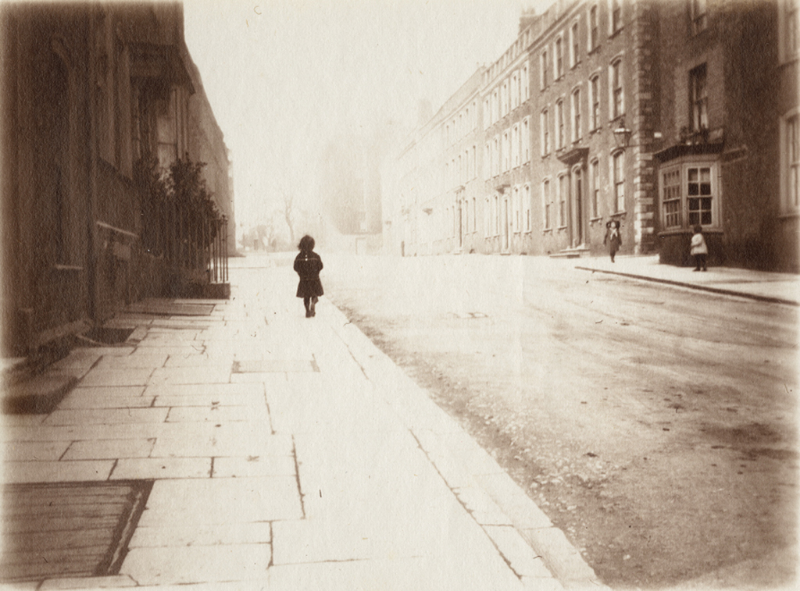 He placed an order for the photos to be digitised, and produced this fantastic blog post. The post was shared widely across his network on Twitter, and the photos were introduced to the world. Turner’s Tower, Hemington, Radstock, Avon. Later that year, Little Toller, described by The Independent as ‘a small but discerning press’, were trying to make a decision. 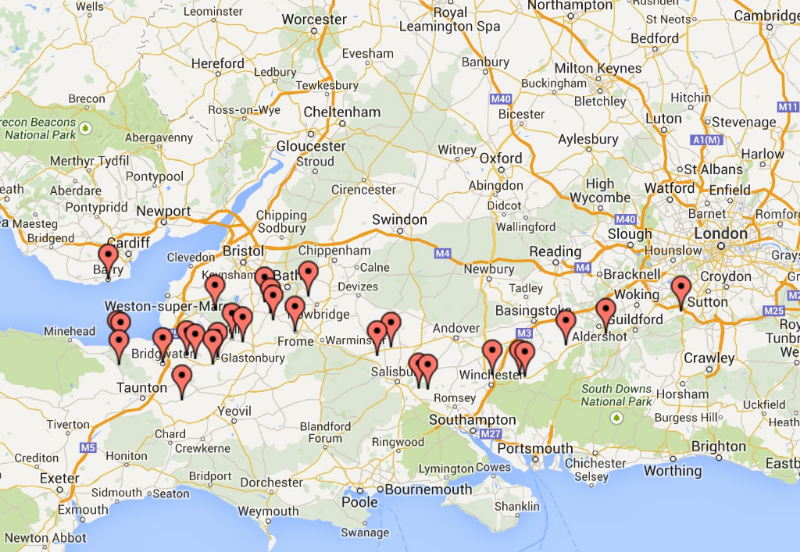 Edward Thomas’ centenary was approaching: should they publish The Icknield Way or In Pursuit of Spring? Stumbling across Rob’s blog post while researching online, an idea grew. What if In Pursuit of Spring could be reprinted, fully illustrated with the snapshots which had inspired its author? Images of a lost, almost car-less England, full of empty roads and paths, speaking of travel, motion and hope. Following discussions with the Edward Thomas Estate, permission was granted to publish the photos in print for the first time, in a brand new edition of the work. Little Toller’s handsome edition of In Pursuit of Spring went on sale on 3 March, Edward Thomas’ birthday, and sold out in just four weeks. Another print run has just taken place, and it is just as well, given that the work has caught the attention of the national media. The Guardian has run an excellent feature which compares the historic images with photos taken in the same locations in the modern day – readers can use the blue sliders on each image to compare then and now. 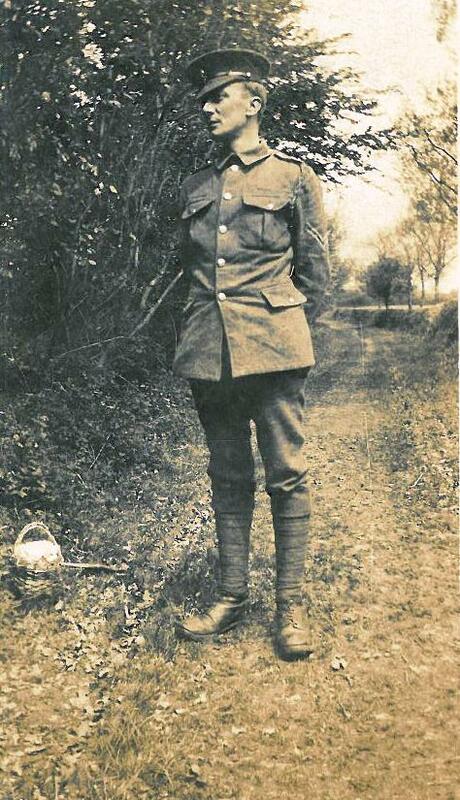 That is the final connection with Easter for this story; the Easter 1913 when he set out, in pursuit of Spring; the Easter Monday 1915 of In Memoriam; and Easter Monday 1917, at Arras where he died. Easter, of course, is when we traditionally celebrate the Resurrection, and it is perhaps fitting that Edward Thomas’ words and now his photographs outlive him. Special Collections and Archives would like to thank Rob Hudson and Little Toller for their role in enabling these images, and Thomas’ work, to reach and be enjoyed by a new generation of readers. All photographs can be viewed on our Pinterest board. This autumn we welcome Professor Emerita Edna Longley from Queen’s University Belfast, to deliver the first of our Rare Books Lectures for 2015/16. 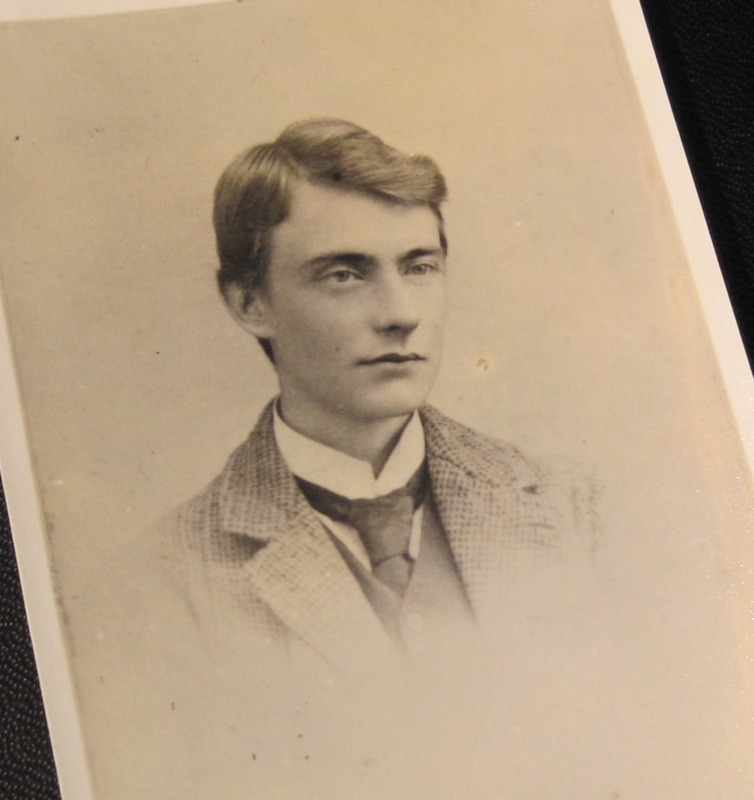 Edna has made many visits to Special Collections and Archives over the years, in order to make use of the extensive family archive of war-poet Edward Thomas, and we look forward to hearing some of the results of this research. Her talk is titled: ‘Finding “something to read”: Edward Thomas’s reviews and early twentieth-century print culture’. The event will be held in Lecture Theatre 0.31, John Percival Building (Humanities), at 5.30pm on Thursday 22 October, sponsored by the College of Arts, Humanities and Social Sciences and Special Collections and Archives, in association with the School of English, Communication and Philosophy. Please contact us at scolar@cardiff.ac.uk to book a place for the talk. Edna Longley’s monographs include Louis MacNeice: A Study (Faber, 1989), The Living Stream: Literature and Revisionism in Ireland (Bloodaxe, 1994) and Poetry & Posterity (Bloodaxe, 2000). She has edited Edward Thomas: The Annotated Collected Poems (Bloodaxe, 2008). Her most recent book is Yeats and Modern Poetry (Cambridge University Press, 2013). She is a Member of the Royal Irish Academy and a Fellow of the British Academy. Edward Thomas (1878-1917), was killed at the front in the First World War. His extensive family archive is held in Special Collections and Archives, and a major series on his prose work will be appearing shortly from Oxford University Press. Conradh na Ghaeilge oedd y mudiad a sefydlwyd i ymgyrchu dros iaith a diwylliant Iwerddon, o fewn y mudiad ymreolaeth. Roedd gan y mudiad gylchgrawn dwyieithog wythnosol, An Claidheamh Soluis, hynny yw ‘Gleddyf Goleuni’. Golygydd cynnar y papur oedd Padraig Pearse, arweinydd dylanwadol yng ngwrthryfel Iwerddon. Dosbarthwyd pamffledi’n hybu gwaith Conradh na Ghaeilge yn Nulyn, Llundain, ac ar draws Prydain. Cytunwyd ar fesur ymreolaeth i Iwerddon gan San Steffan yn 1914, ond cafodd ei ohirio pan aeth Prydain i mewn i’r Rhyfel Mawr. The Gaelic League was the cultural strand of the Irish Home Rule movement focusing on a revival of Irish culture and language. Its journal was An Claidheamh Soluis, or The Sword of Light, a weekly, bilingual newspaper. An early editor and contributor was Patrick Pearse who later became an influential leader of the Irish rebellion. Pamphlets promoting the study and advancement of Irish and the work of the Gaelic League were distributed in London, Dublin, and throughout Great Britain. At the beginning of 1914, the Irish Home Rule Bill appeared to pass through Parliament, but was later suspended as Great Britain entered the First World War. An Claidheamh Soluis. Samain, 29, 1913. Gaelic League. Dhá adhbhar déag: Seo dhá adhbhar déag fá’r cóir do gach Éireannach an Ghaedhilg do bheith fá mhear aige. [Twelve Reasons Why Irishmen Should Know, Prize, and Cherish the Irish Language.] ca. 1900. Ryan, W. P. The Work of the Gaelic League: Points for Irish People in Great Britain; How to Start and Conduct Branches. 1902. Prif fudiad tu ôl i’r galwadau am ymreolaeth i Gymru oedd Cymru Fydd. Roedd yn fudiad diwylliannol i ddechrau, ond â chysylltiadau â’r Blaid Ryddfrydol, ac ymgyrchodd dros ymreolaeth i Gymru yng nghylchgrawn y mudiad, Young Wales (yn ddiweddarach Wales: a National Magazine). Er yn gefnogol yn y dechrau i Gymry Fydd, yn ddiweddarach symudodd David Lloyd George i ffwrdd o’r mudiad, a diflannodd y corff wedyn. Serch hyn, roedd digon o gefnogaeth yn 1914 i hybu Deddf Ddatgysylltu’r Eglwys, ond gohiriwyd hon ar ôl i Brydain ymuno yn y Rhyfel Mawr ym Mis Awst. The driving force behind the Wales Home Rule movement was Cymru Fydd, or Young Wales. 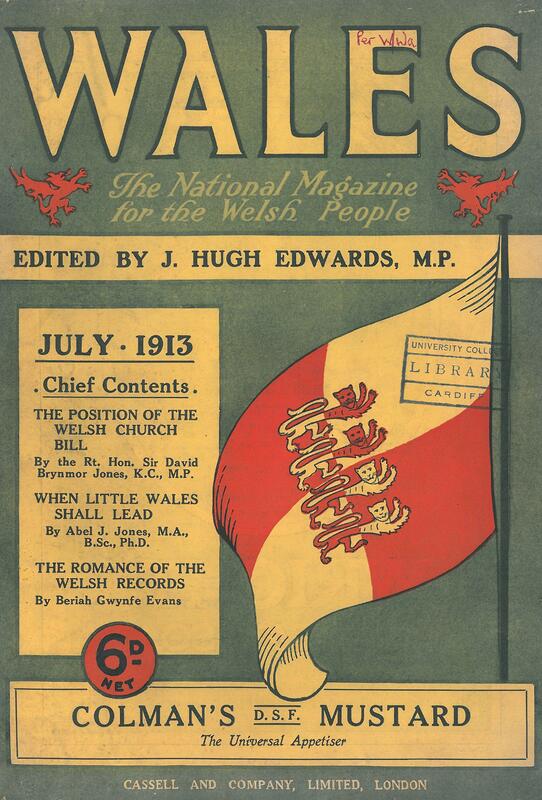 As a cultural organisation it was linked with the Liberal party in Wales, and campaigned for Welsh home rule via the journal for the organisation, Young Wales (later Wales: a National Magazine). Although an early advocate for Cymru Fydd, David Lloyd George later distanced himself, and the movement collapsed subsequently. Momentum appeared promising for Parliament’s approval of the Welsh Disestablishment Act of 1914, but by August it was suspended as Britain entered in the First World War. Celt, A. Cymru Fydd Cymru Rydd: Or the National Movement in Wales. 1895. Fowell, R. W. and Dibdin, L. George. The Welsh Disestablishment Bill, 1909 with Explanation Notes and Compared with the Bill of 1895 and the Irish Disestablishment Act of 1869. 1909. Downing, S. E. Disestablishment and Disendowment under the Welsh Church Act, 1914. 1915. John, Edward T. Ymreolaeth Gyfunol: Safle A Hawliau Cymru: Manteision Senedd Gymreig. 1910. Edwards, J. Hugh. (ed.) Wales: A National Magazine. July 1913. John, Edward T. National Self-Government: How Wales Stands to Gain By It: Advantages of A Welsh Senate. 1910. Edwards, J. Hugh. (ed.) Young Wales. March 1901. Gwirfoddolodd nifer yn y fyddin dan anogaeth David Lloyd George, a chonsgriptwyd nifer hefyd, i greu bataliwn ‘Cymreig’ (y 38ain), a alwyd yn fataliwn Lloyd George. Ym Mis Gorffennaf 1916 lladdwyd neu anafwyd tua 4,000 o Gymru ym Mrwydr Goed Mametz ger y Somme. Yn yr un cyfnod yn Iwerddon fe gododd Gwrthryfel y Pasg pan gipiwyd canol Dulyn, dim ond i filwyr Prydeinig eu gorchfygu dyddiau’n ddiweddarach. 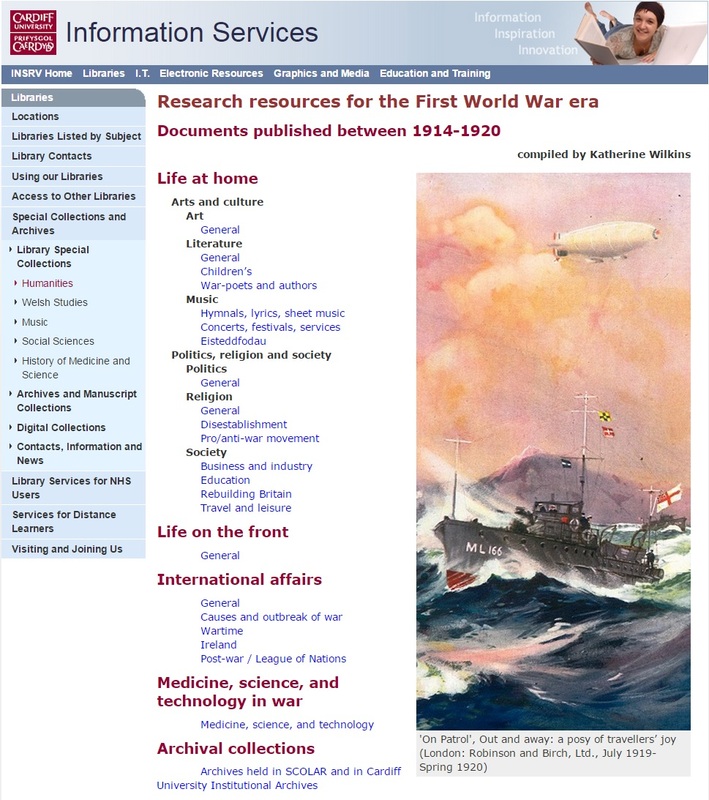 Cyhoeddwyd ffotograffau o ddigwyddiadau gydol y rhyfel gan y ‘War Illustrated’, yn cynnwys yma rhai o filwyr Cymru ac Iwerddon nid nepell o flaen y gad. 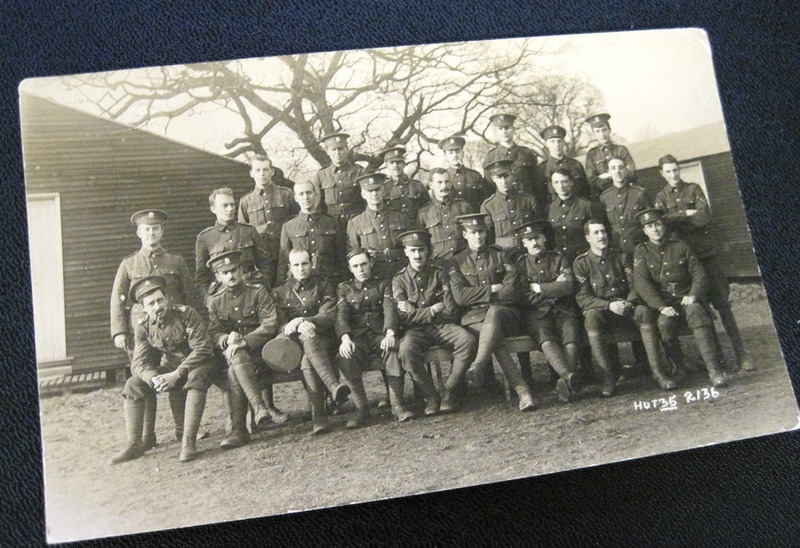 Whether conscripted or spurred by David Lloyd George’s rhetoric, a large number of Welshmen joined the 38th (Welsh) Division, also known as Lloyd George’s Division. 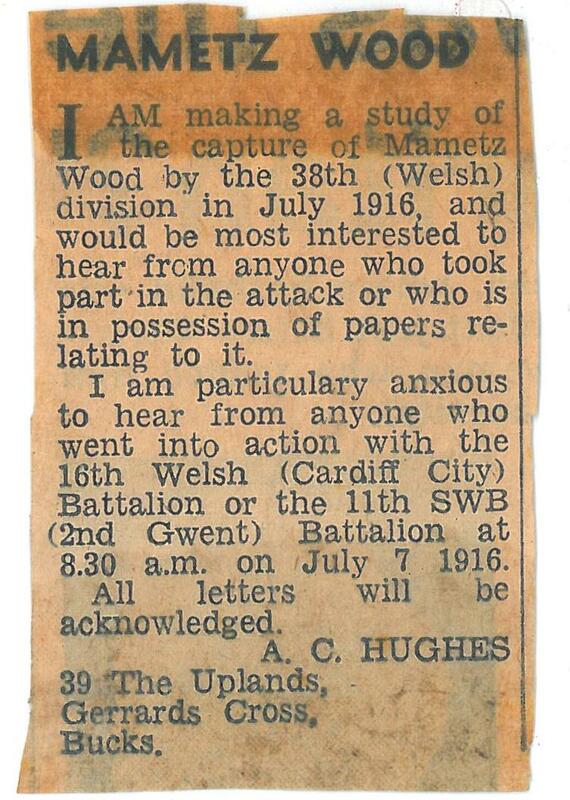 In early July 1916 nearly 4,000 Welshmen were killed or wounded at the Battle of Mametz Wood on the Somme. Meanwhile, Ireland was recovering from the repercussions of the Easter Rising, when in April 1916, rebels seized Dublin, only to be quelled by British forces a few days later. 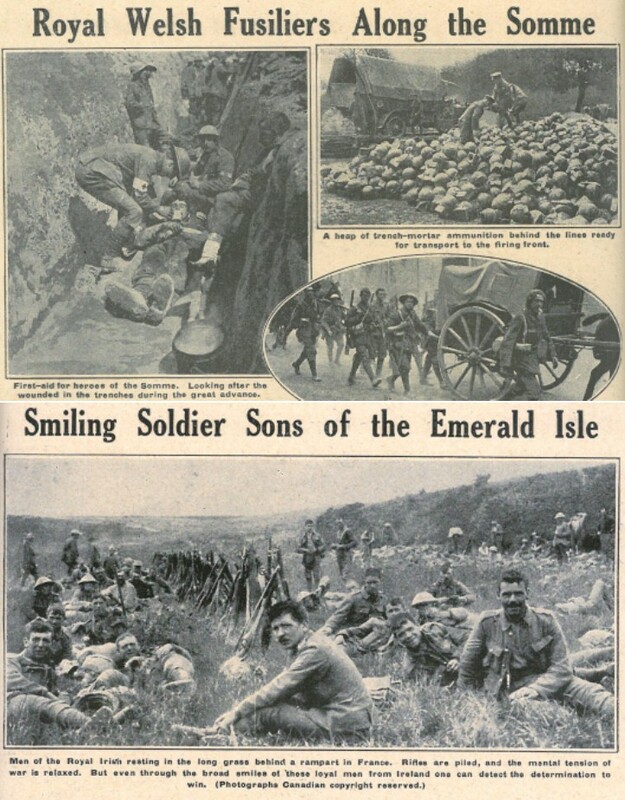 The War Illustrated published photographs throughout the war, included here are some Welsh and Irish soldiers on the Western Front. 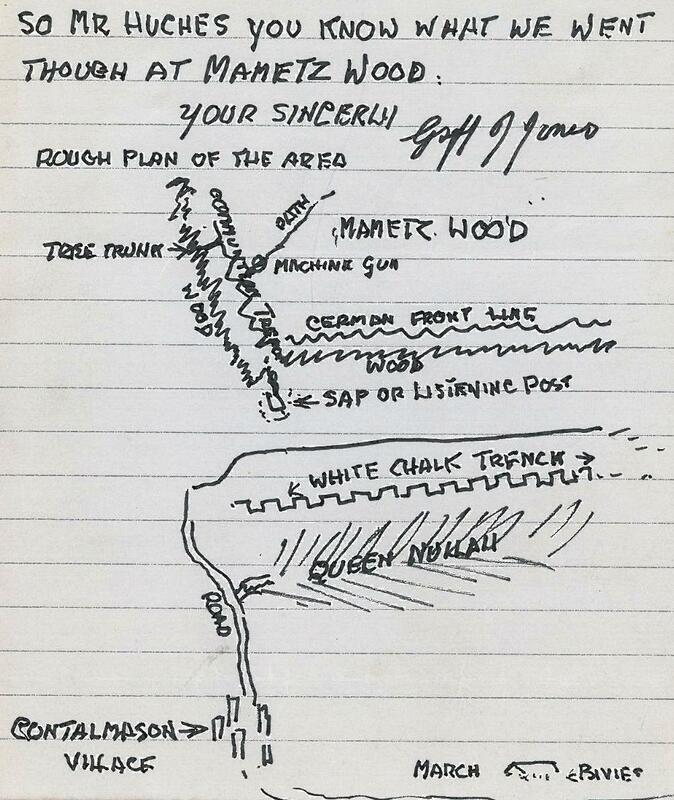 Muirhead Bone (the official war artist). The Western Front. 1917. The Great War: The Standard History of the All-Europe Conflict. Vol. 7. The War Illustrated: A Pictorial Record of the Conflict of the Nations. 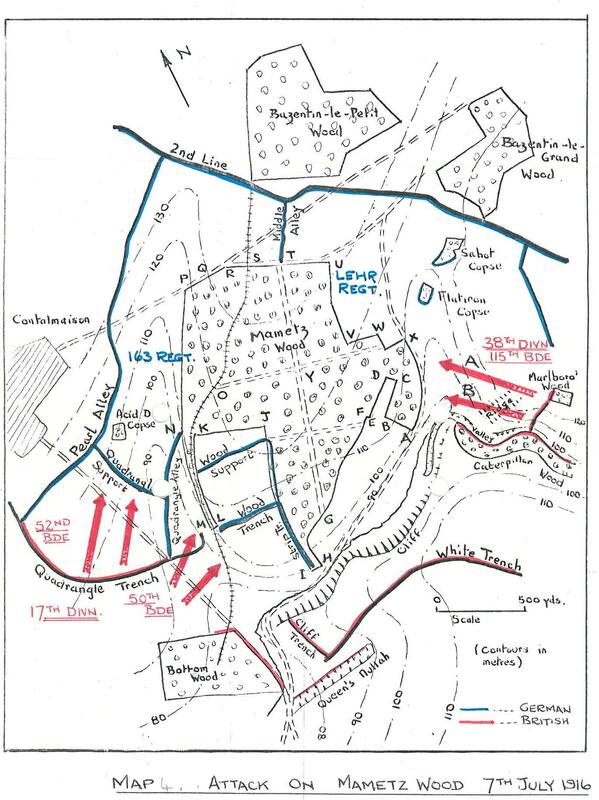 29 July 1916. Er gwaethaf galwadau gan Kitchener i ddynion godi arfau, a’r ddeddf gonsgriptio hefyd, gwrthododd rhai ymuno â’r fyddin. Yng Nghymru cyhoeddwyd cryn nifer o bamffledi a chylchgronau heddychol, gan y rhai â daliadau crefyddol neu wleidyddol cryf. Gweithiodd Thomas Rees, pennaeth Coleg Bala-Bangor fel golygydd y cylchgrawn heddychol ‘Y Deyrnas’. Cafodd T.E.Nicholas ei garcharu am wrthod ymladd, ar sail heddychol a sosialaidd. Yn Iwerddon doedd fawr o awydd gan lawer i ymladd ar ran Prydain yn ei rhyfel tramor. Beirniadaeth hallt oedd ymateb y wasg Brydeinig i’r ‘shirkers’ honedig hyn. Despite Kitchener’s call to arms and the newly passed Conscription Bill, some British refused to join the forces. In Wales, spurred by religious and political beliefs, a growing number wrote passionately for pacifism publishing pamphlets, books, and newspapers. Thomas Rees, principal at Bala-Bangor College and an objector on Christian principals, served as editor of Y Deyrnas. T. E. Nicholas, an out-spoken, Socialist pacifist was incarcerated for his objection to fighting. 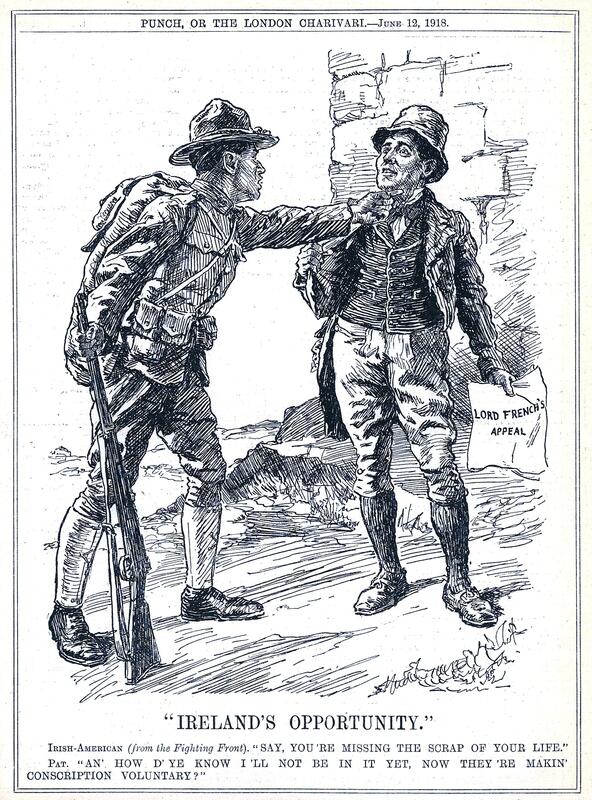 In Ireland, with rebellion surfacing, there was little interest in fighting Britain’s war overseas. The British press offered harsh criticism of so-called “shirkers”. Nicholas, Thomas Evan. Dros Eich Gwlad. 1920. Rees, Thomas. (ed.) Y Deyrnas. Chwefror 1917. Mae Cymru ac Iwerddon ill dau yn dathlu eu traddodiadau llenyddol gan wobrwyo awduron a beirdd yn eu gwyliau diwylliannol cenedlaethol, yr Eisteddfod a’r Oireachtas. Yn yr Eisteddfod yn 1917 cafodd Hedd Wyn ei gadeirio, wythnosau ar ôl ei farwolaeth ar flaen y gad. Awdur poblogaidd ar y pryd oedd Arthur Machen, a nes ymlaen David Jones a oedd yn arlunydd hefyd, ac Edward Thomas o deulu Cymry Llundain (mae Prifysgol Caerdydd yn dal ei archif llenyddol enfawr). Yn Iwerddon adlewyrchiad o hyder cenedlaethol oedd gweithiau Padraig Pearse. Er yn pellhau ei hun oddi wrth Wrthryfel y Pasg, roedd W.B. Yeats yn dal yn wladgarwr wrth reddf; un o weithiau Yeats sydd yma, o gasgliad gweisg preifat Prifysgol Caerdydd, un o’r ddau gasgliad pwysicaf o’i fath ym Mhrydain. Wales and Ireland both celebrate their individual literary traditions prizing authors and poets at their respective cultural festivals, the Eisteddfod and Oireachtas. 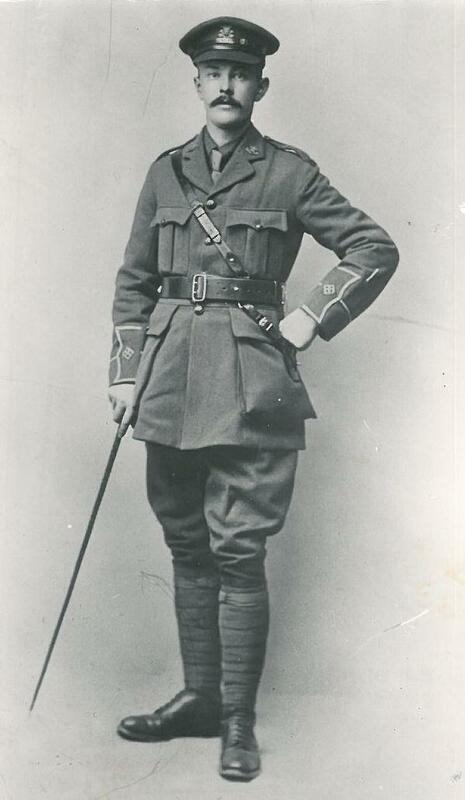 At the 1917 Eisteddfod, ‘Hedd Wyn’ (Ellis Humphrey Evans) was awarded the highest honour posthumously, the Bardic Chair, having been killed on the Front only weeks earlier. 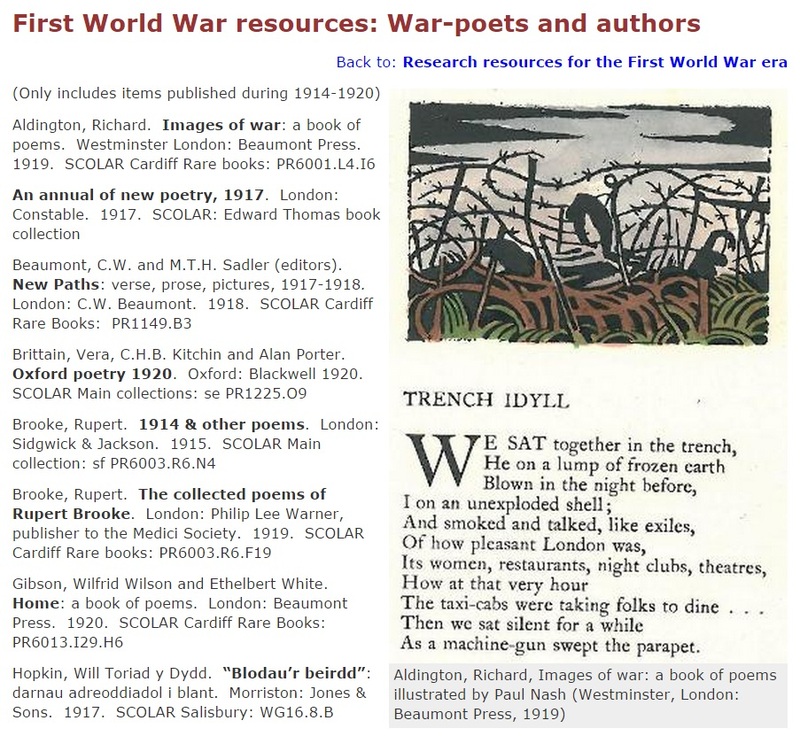 Other popular Anglo-Welsh wartime authors included Arthur Machen, David Jones who was an equally accomplished artist, and Edward Thomas from a London-Welsh family (Cardiff holds an extensive archive of Edward Thomas materials.) In Ireland, the prolific writings of Patrick Pearse boosted a surge in Irish pride. An Irish Nationalist at heart, William Butler Yeats distanced himself from the events of the Easter Rising in 1916. One of Yeats’ works is shown from the Cardiff Private Presses collection, one of the two largest such collections in Britain. 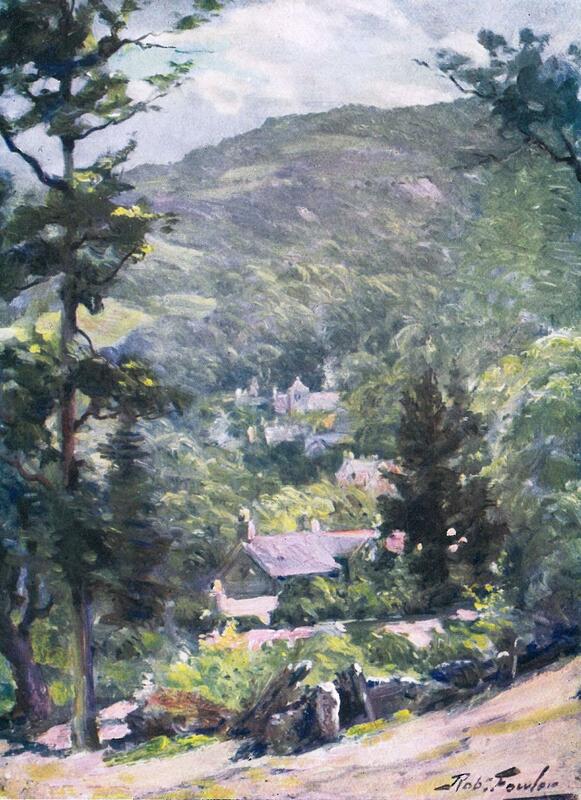 Bettws-y-Coed, from Edward Thomas, Beautiful Wales. 1905. Rhaglen Swyddogol Eisteddfod Frenhinol Genedlaethol Cymru. 1917. Cofnodion a Chyfansoddiadau Eisteddfod Genedlaethol. 1917. Wyn, Hedd. Cerddi’r Bugail: Cyfrol Goffa Hedd Wyn. 1918. Thomas, Edward. Beautiful Wales. 1905. Hyne, Anthony. 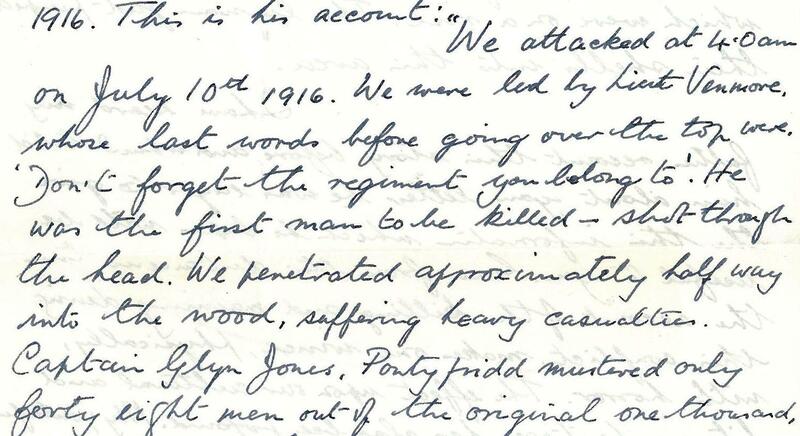 David Jones: A Fusilier at the Front. 1995. Pearse, Desmond Ryan (ed.). Collected Works of Padraic H. Pearse: Plays, Stories, Poems. 1917. Yeats, William Butler. Responsibilities: Poems and a Play. 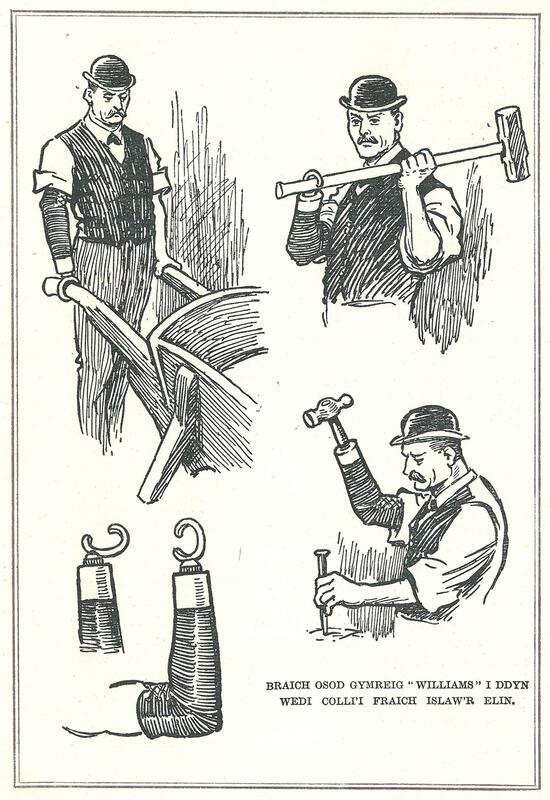 The Cuala Press, 1914. Machen, Arthur. Angel of Mons: The Bowman and Other Legends of the War. 1915. Llwybrau gwahanol oedd etifeddiaeth y rhyfel i Gymru ac Iwerddon, er yn cwrdd weithiau, fel yn Fron-goch, lle’r oedd gwersyll i 2,000 o garcharorion Gwyddelig. Yn 1920 gwireddwyd Deddf Ymreolaeth Iwerddon nifer o amcanion y mudiad ymreolaeth, ond heb chwe sir y gogledd, ac felly yn tanio gwreichion yr IRA nes ymlaen. Yng Nghymru gwelodd ffrwyth yr ymgyrch i ddatgysylltu’r Eglwys, eto’n rhan o weledigaeth y mudiad ymreolaeth cynharach. Gwelwyd cefnogaeth eang i sefydlu Cynghrair y Cenhedloedd yng Nghymru. Dangosodd ôl y rhyfel mewn amryw o ffyrdd, dynion yn ceisio dychwelwyd i’w gwaith, a menywod dros 30 yn ennill y bleidlais. The legacies of Wales and Ireland remained entwined as nearly 2,000 Irish rebels were held prisoner at Fron-Goch in North Wales. However, by 1920, the two nations embarked on separate paths. In 1920, The Government of Ireland Act, following the Home Rule demands, established a self governing Ireland, minus the six counties in the north, fanning the sparks that would ignite the IRA. While in Wales, the Welsh Disestablishment Bill was enacted, motivated in part by the Home Rule demands. Enthusiasm in Wales for organising future peace through the League of Nations increased. Post-war society reflected changing pressures as returning soldiers sought a return to normalcy and women aged 30 and older won the vote. Ysbysty Tywysog Cymru i Forwyr a Milwyr Cymru a Sir Fynwy Wedi Colli Aelodau yn y Rhyfel. 1918. Ebenezer, Lyn. 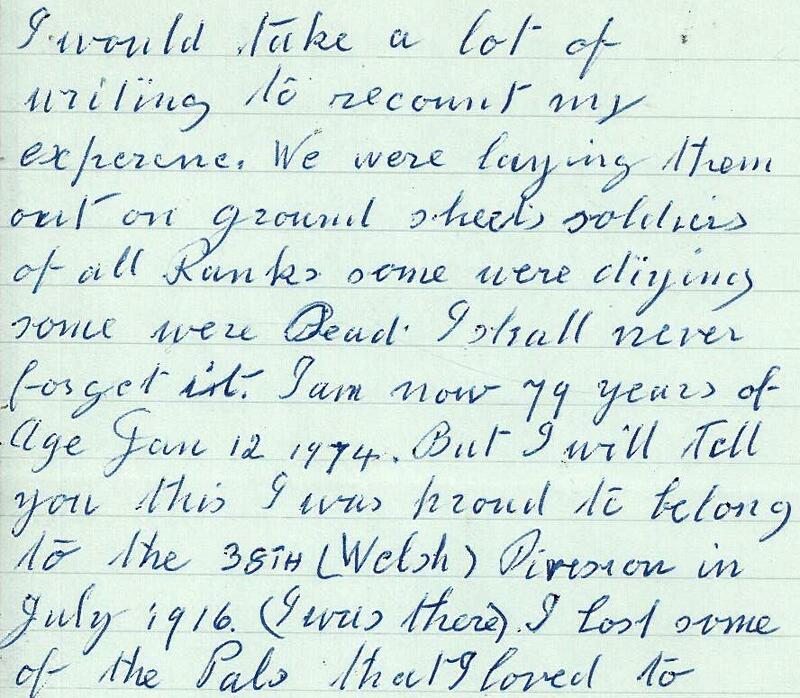 Fron-Goch Camp 1916 and the Birth of the IRA. 2012. O Mahony, Sean. Fron-Goch: University of Revolution. 1987. 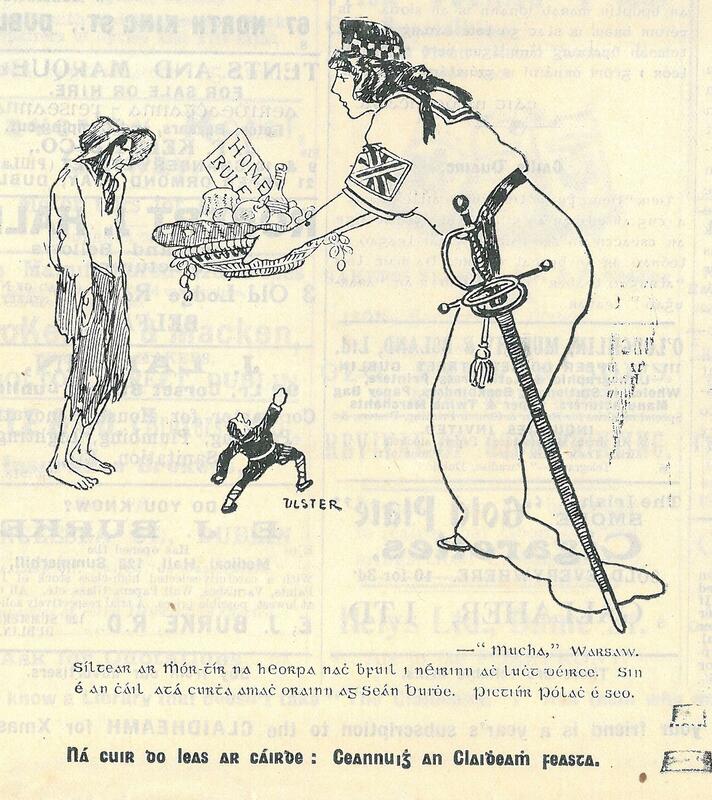 The Easter Proclamation of the Irish Republic, 1916. 1960. Garnett, Maxwell. Organising Peace: Being an Account of the League of Nations. 1928. League of Nations. How you Can Join the League of Nations Union and Help Forward the Most Practical Means of Securing World Peace.